In a Rappler interview with Australian Foreign Minister Julie Bishop, hopes of meeting President Rodrigo Duterte and his administration were conveyed in order to reaffirm the Philippines and Australia's deep commitment to working cooperatively as partners and to continue the both countries long standing friendship. Bishop was impressed at how Duterte managed to shift the consequences of the failures of neo-liberal democracy. She sees Duterte as a man that responded to the concerns and needs of his people. A lesson that every politician around the world could use, “...particularly to those who feel left behind by globalization, those affected by the disruption of technologies and those who fear change,” she stated. With today’s technology that’s giving power to the voice of the power to the people and the anger of the due to marginalization, Bishop takes these two factors as a challenge to the current government that can be only be overcome by equitably sharing the benefits of globalization. As recent leaders are strong and populous men, the foreign minister’s take on this feminist question would be as simple as “work is work”, whomever the people chooses doesn’t matter. To Bishop, what matters most is the interests of the country she represents and the country that she’s meeting with, for the end goal of her job is to get both countries to cooperate in common interest only. “…I don’t see a shift at the US foreign policy (TPP) at all when it comes to our region” stated when questioned on all the recent economic events around the Asia-Pacific with regards to the Philippines. 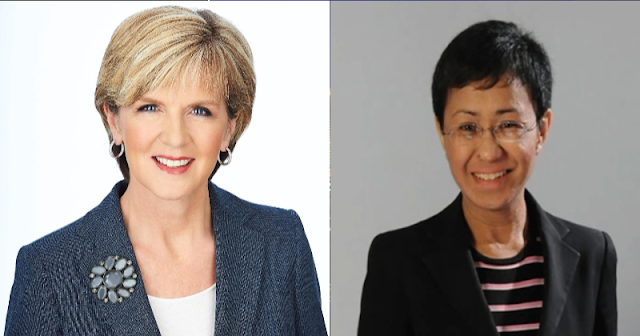 In fact she mentioned that the US is reaffirming their relationship with Asia-Pacific countries, providing security guarantor since the Second World War that gave ‘relative peace stability’ and that the US has helped both Australia and the Philippines to grow economically. So despite the differences that she sees between US and countries in the region, Bishop believes that the US will remain committed. Bishop admits that China is their largest trading partner and that they have a “strategic comprehensive partnership” with it. She acknowledged China as a rising economic power which will eventually results as its status as a rising military and strategic power, but encourages the country to become a “global player”. And despite the TPP was spearheaded by former President Obama, Bishop hopes that other trade agreements would follow the TPP’s benchmark, specifically its “high standards as a quality free trade agreement”. 6. Would Australia have TPP-like trade agreements? Australia at the moment is still working with 12 other countries while maintaining contact with the US in relation to it. But existence of other trade agreements do exist, like the ones in Indonesia, India and the ASEAN-centered Regional Comprehensive Economical Partnership (RCEP). Bishop talks highly of the ASEAN during meetings with the US for it has a “strong and powerful voice and considerable law of force when it comes to issues that is of common interest to ASEAN countries”. 8. How does the rise of technology and social media impact governance? Bishop replied with, “Governments and politicians over decades have used or feared technologies depending upon how they adapt.” While admitting that social media is indeed used to engage to a majority of the masses, Bishop still considers it a two-edge sword due to the anonymity of its users. But it’s still up to how politicians embrace it and enhance it to their advantage. Bishop finds any kind of violence or abuse to be clearly unacceptable. And she advocates against it with the number of government initiatives that she’s taken part in while encouraging men to be “ambassadors to promote a violent free world in terms of women and their families”. She also states vigilance must be kept for the internet and social media is just one outlet for such abuse. 11. Are women in a better place today? “Of course, I think that women have come a very long way. The International Women’s Day is an opportunity to celebrate the achievements of women. But of course we have a long way to go before we can confidently say that women have opportunities equal to men, in order to fulfill their potential,” the Foreign Minister replied. Bishop states that there is deep concern for such terrorist organizations, and a coalition to crush ISIS at is source has been formed. Australia is working closely to Indonesia, Malaysia and the Philippines in order to obtain a share information and intelligence. Bishop explained that these matters have been raised with authorities in the Philippine government and a number of programs for education and peace process have been made by Australia. Challenges of uncertainty was the highlight of the previous year and still will be in the future, so Bishop hopes that these challenges bring opportunities to create strengthen bonds on economic and strategic. In conclusion, the Foreign Minister repeatedly mentioned that Australia is ready to create a mutually beneficial relationship with the Philippines. And despite all the differences, it just serves to prove that Duterte has proven his bold actions to of incredibly fruitfulness without negative consequences. A genius indeed.